After everyone has headed off for the day I sit down and have my breakfast – my bowl of cereal. This is my quiet time when I read a few pages from one of the décor magazines I subscribe to. The other morning while reading I came across this advertisement that made me stop and think. 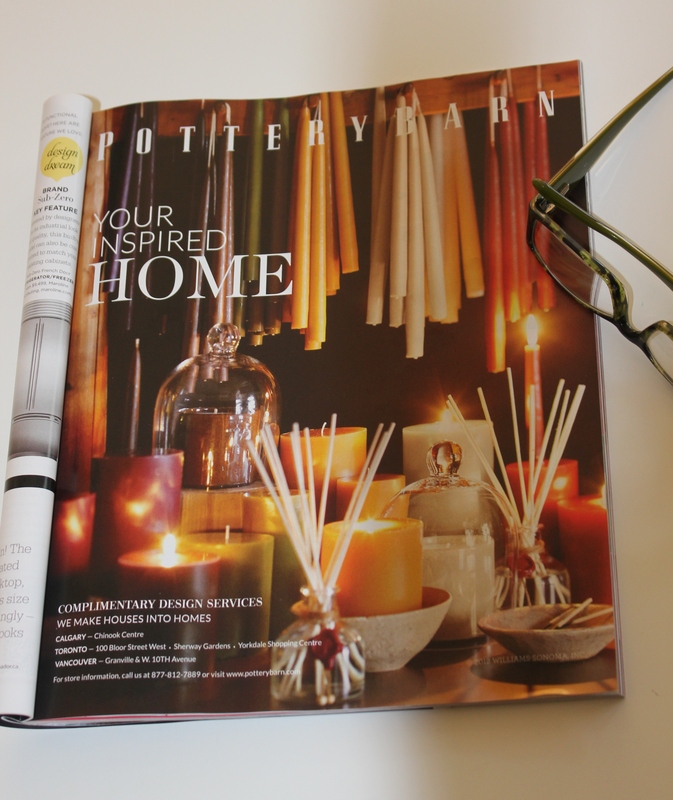 This Pottery Barn advertisement was a variety of candles in green, red and gold. To me it was something that felt very 1980’s; specifically the colours of the 1980’s and early 1990’s. Hunter green, burgundy and gold. (The colour of our first master bedroom c. 1990!) Very dated. 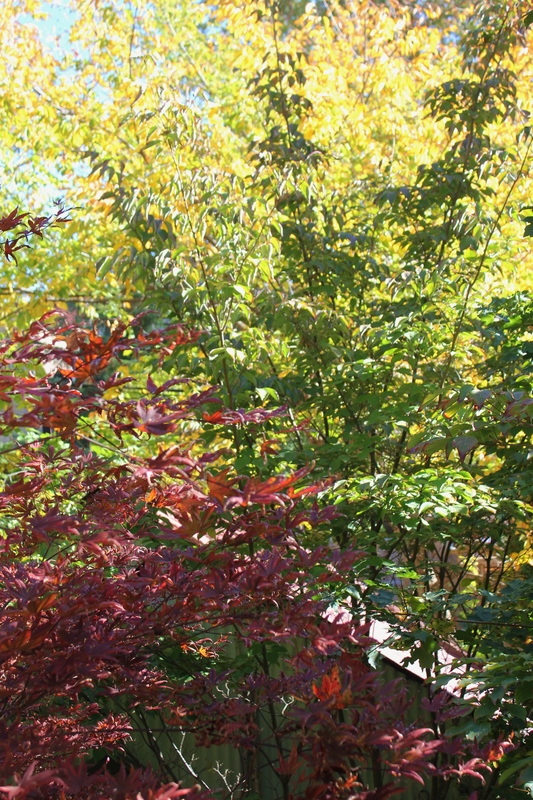 But when I happened to look up and notice the view out my kitchen windows I realized these colours are still very current. The outstanding colours of fall as the leaves turn into brilliant greens, reds and gold are never boring or dated. They are inspirational. 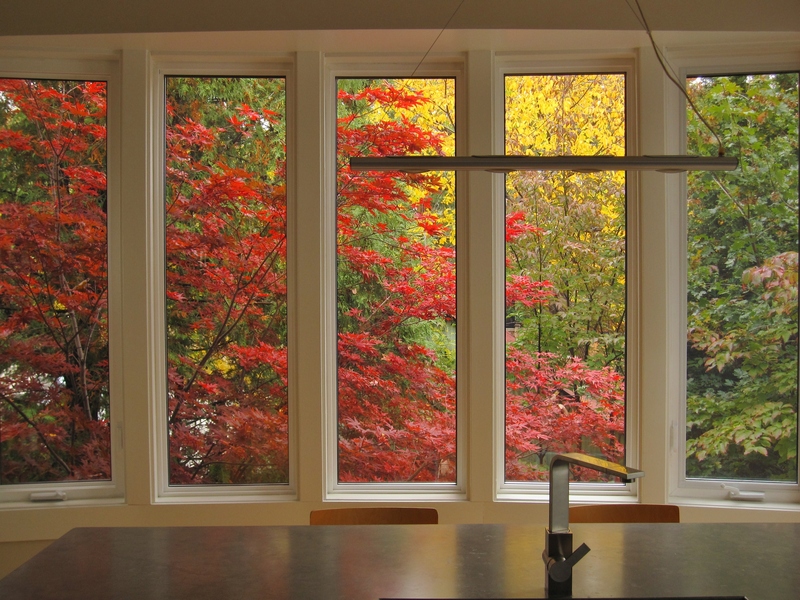 The view from my kitchen window in the fall always amazes me and no matter how many times I walk into the room I am in awe. 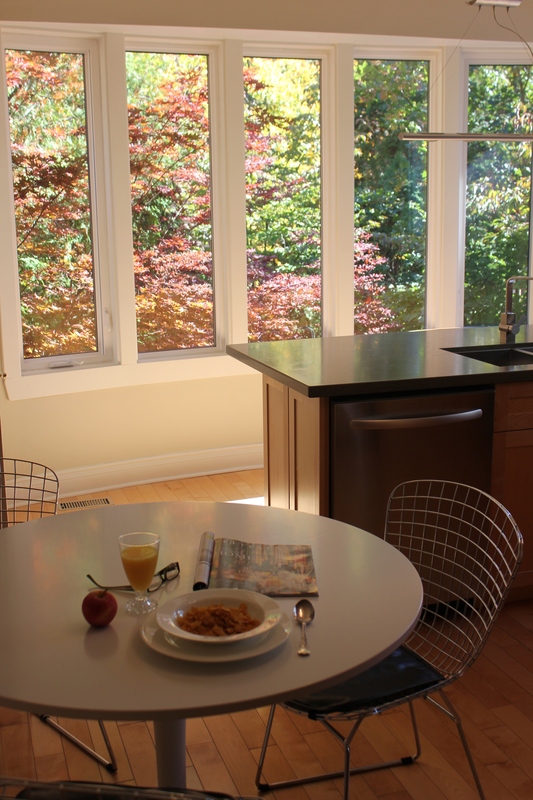 When we originally renovated the kitchen it was about capturing the view, the colours, and the effect of nature. I have almost no upper cabinets but the tradeoff is spectacular. I also realized that hunter green, burgundy and gold is a colour scheme that will never get old just re-named – sage, cranberry and yellow (as I read a few pages further in the magazine). This entry was posted in Colour, Design and tagged color, DECOR, Inspiration, Interior Design by Modmissy. Bookmark the permalink. These are my colors–earthtones–greens, browns, dark reds. I certainly hope they never go out of style. With windows like yours, who needs paint on the walls? Gorgeous! The colors will never go out of style – just the names. Hope you are enjoying the fall at Apple Hill Cottage! What is the view out your kitchen window? Always love your photos and seeing the world through your eyes. Sometimes the best sights really are just outside our own windows. Keep sharing! I wish the view out my kitchen window was as gorgeous as this one! Thanks YLF. What do you see out your kitchen window? Wow! Over 7 billion people in this world and I randomly decide to ask you about what you see out your window and you have a name that is related to a window view!!!!!! OMG. Figure that out. And by the way that is a beautiful story and name.